Looking to get rid of unwanted body hair but dreading the discomfort of a Brazilian wax? While Brazilian waxes may leave you with baby-smooth skin all over, the physical pain of using hot wax to wrench hairs out of their follicles (not to mention, the emotional pain of having to fork over all that money!) may be enough to make you think twice before making a trip to the salon. Luckily, there is another way: epilation is an alternative method to remove hair with many of the same benefits provided by Brazilian waxing. While a best epilator for Brazilian gives the same silky results as a thorough Brazilian wax, using an epilator may also spare you the physical discomfort and monetary loss associated with Brazilian waxing! By pulling out hair at the roots, epilators maximize the longevity of your super smooth results and also cause hairs to grow back thinner and easier to remove. When it comes to finding the best-rated epilators for Brazilian, you may be overwhelmed by the vast selection of hand-held hair removal systems available on the market. This guide has narrowed it down to the top five best epilator for bikini area! The Panasonic ES-ED90-P is one of the best epilator for bikini area. Don’t let the complicated name of this product fool you—this epilator is very gentle and convenient to use on sensitive areas. It is one of least painful epilators make it an ideal choice for doing a Brazilian. It features a unique pivoting head that moves 35 degrees forward and 25 degrees backwards, to easily fit the curves of your body for a smooth, comfortable and effective hair removal. In addition to this pivoting head it has a small gentle epilation head specifically designed for your bikini areas. In fact, the Panasonic ES-ED90-P is extremely versatile—this model has six interchangeable attachments and can be used on both wet and dry skin! These six attachments include a shaver head for trimming hair, a gentle epilation head perfect for sensitive areas, an epilator gentle cap for anyone sensitive to pain, a bikini comb, a dual-disc epilator head with 48 rotating tweezers, and even a pedicure buffer for the added bonus of soft feet! Each of these heads can be used at two different speeds depending on your pain tolerance level. The dual disc wide epilation head works by holding the skin down and removing the hair from the root. It comes with a fast cap for normal use and a gentle cap attachment for first time users to further reduces any pain or irritation. For your bikini area and underarms you can use the smaller gentle epilation head. The interchangeable head can easily cover hard to reach areas and has only 18 tweezers making it more suitable for bikini line regions. The shaver head is made up of hypoallergenic stainless steel covered by protective foil, which prevents irritation (so, bye-bye red bumps!). You can use the shaver first to trim your bikini hair to a suitable length for epilation. The shaver head also has a pop up trimmer and a bikini comb attachment to trim your hair with great precision. This cordless model also has a built-in LED light so you don’t miss a hair! Despite all these functions, the Panasonic ES-ED90-P can run for up to 30 minutes on a single charge of one hour although it cannot be used while plugged in. The Panasonic ES-ED90-P can be fully submersed in water making it suitable to use in shower for more comfort and also allows easy cleaning. You can even use it with foam by adding the gel to epilator head, which makes it even better for those with sensitive skin.Check below video to see it in action! The second device in the running for the best bikini epilator is the Emjoi Soft Caress epilator. 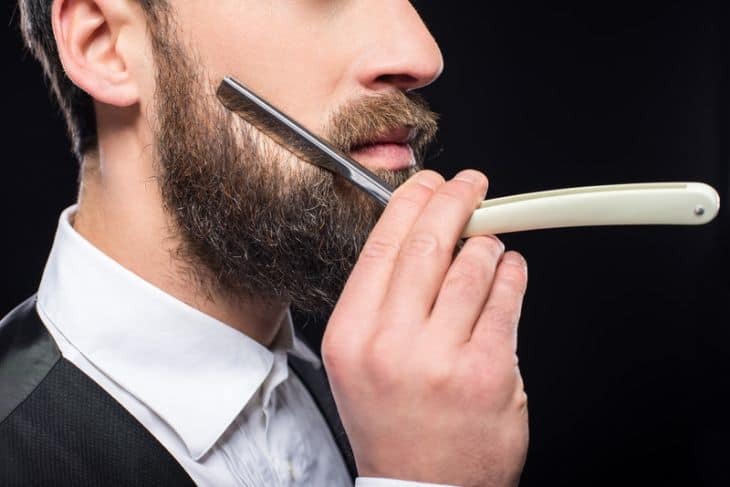 This luxurious device features 36 moving 24-karat gold-plated hypoallergenic tweezer heads that manage to pull out hairs as short as 0.5 mm (meaning you don’t need to regrow a forest of hairs between touch-ups!) with least possible irritation. The Emoji soft caress epilator utilizes patented Pain Reduction Technology to reduce the physical discomfort of epilation. This epilator has small ergonomic design with soft touch grip making it more suitable for removing hair from bikini line, underarms and even upper lips or chin. Always ensure to check the pain levels before using on your face. The 2-speed tweezers on the Emjoi Soft Caress also offers anti-microbial protection. However, there is no option to epilate on wet skin or immerse the product in water. Rather, this epilator can be used wirelessly or even while the device is plugged in and charging. The battery lasts for 30 minutes with 8-16 hours required for a full charge. The device seem more powerful when plugged in. This epilator comes with several accessories, including an instruction booklet, travel pouch, cleaning brush, a loofah, and even a massage finger attachment. With these tools you are guaranteed up to six weeks of glamorously baby-smooth skin! The epilator is quite loud during operation and due to its smaller head can be time consuming to remove all the hairs in large areas. It supports only dry mode of operation and there is no built-in light. Overall it is a good compact epilator for beginners looking for a bikini line epilator and is also easy to carry around. The Braun Silk-épil 7 series is one of the best-selling epilators ever which makes it a good candidate for bikini hair removal. The Braun Silk 7561 has a Close-grip Tweezer technology for high efficiency and can remove even the smallest hair with least pain. It has 40 tweezers on a pivoting head and a high frequency massaging system giving you an extra gentle epilation experience. The unique SoftLift Tips on the epilator head lifts even flat lying hair and guide them to tweezers for effective hair removal. Aside from the regular epilator head, the accessories that come with this epilator include a shaver head, a trimmer cap, precision cap, efficiency cap and a facial cap. The shaver head and bikini trimmer head allows you to trim the bikini hair to desired level for a quick clean up or to prepare the area for epilation. For epilating your bikini areas you can use the precision cap that limits exposure to few tweezers at a time to reduce the pain. If you want to remove coarse thicker hairs and use the efficiency cap that ensures maximum skin contact for quick and smoother removal. Use the lower speed setting for sensitive areas. The Braun Silk-épil 7 -7561 can be used in the shower and cleaned easily in water. It also comes with built-in lights to illuminate the areas of skin you are working on. The cordless rechargeable epilator gives 30 to 40 minutes of operation with one hour of charging. Of course the Braun Silk-épil 7 -7561 costs a little extra, but if you are sensitive to pain this may be the best epilator for pubic hair! Could the Philips Satinelle Advanced Wet & Dry Epilator with 6 Accessories be the best epilator for pubic hair? The Satinelle advanced has nice ergonomic S-shaped design with an anti-slip grip which makes it comfortable to hold and easily reach the sensitive areas. Philips claims that its epilation head is one of the widest on the market, measuring 30 mm wide. The epilator head consists of 17 unique micro-ridged ceramic discs that grabs the finest hairs with ease. It also features a patented epilation system that guides flat lying hairs to the tweezers for maximum efficiency. It also comes with a shaver head and comb, an in-use massage cap, facial cap, delicate area cap and a travel pouch so you can keep up your epilation routine even on vacation. The massage cap with rollers increase the comfort level by massaging the skin while it moves. The facial and delicate area caps have limited hair catching points thereby reducing the pain while covering sensitive areas. It only takes 1.5 hours to fully charge this epilator, and the battery lasts for up to 40 minutes-plenty of time for you to get smooth from your face to your legs! An optilight is also present which turns on automatically while epilating but the built-in light can be turned off if desired by holding the power switch for 3 seconds while switching on. It even has a battery indicator light that turns orange to indicate the epilator needs to be charged. Also has two speed levels for removing hair with the lower speed suited for sensitive areas. 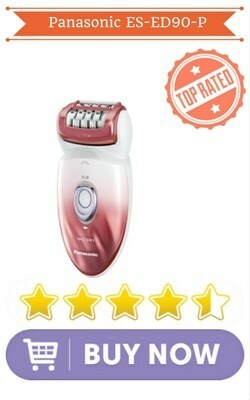 Just bump up the speed on this epilator for a better grip on thicker, hard to tweeze hairs. Just like the Panasonic ES-ED90-P and the Braun Silk-épil 7-7561, this model is fully functional in the shower, but can also be used on dry skin, as well—and it costs less. Don’t forget using the epilator in the shower may also help to ease the discomfort of hair removal as the epilator glides across your wet skin. This epilator made it onto our list of top five epilators for Brazilian due to its design and bikini hair removing capabilities. It has curved head that follows your body contours making it suitable for bikini areas. The Philips HP6401 has 21 textured ceramic discs, unlike the common smooth, metal tweezers found in most epilators. The discs are hypoallergenic as well, which helps reduce the irritation felt (and sometimes seen!) after epilation. It has an active massaging system that simulates and soothes the skin. For bikini areas it is best to use with the performance cap that ensures optimal skin contact with its pivoting motion for a smooth efficient hair removal. This corded epilator gives you continuous usage and ergonomic design makes it easier to use when plugged in. It has 2 speed settings. Another important thing to note about the Philips HP 6401 is that it is not waterproof. But the heads are washable so you can keep your tools nice and clean at all times! This epilator is less expensive than some of the others featured in this guide, but is still known for its effectiveness—you may have nice, hairless skin for up to 6 weeks! Now before you start pulling those pesky hairs out of your body, there are a few things you should know. In a word, epilators are perfect for anyone trying to save money in their beauty regimen, but they certainly are not for the pain-sensitive. It would be a lie to say epilation is a comfortable feeling, but if done regularly, removing hairs with an epilator hurts less over time. This is because after achieving those sleek, hairless results, new hairs grow back thinner and are easier to remove. It only takes a couple of painful epilation sessions before you become a pro! Still, if you are especially sensitive to pain, it may make more sense to buy an electric razor than an epilator. Epilators make a great substitute for your expensive Brazilian waxes—the average salon may charge anywhere between $35 and $70 for a visit depending on locations. So, if your wallet is hurting, it may be more practical to get yourself a personal epilator. Epilators costs between $55 and $100, the same you would be paying for one trip to the salon anyway and can last for up to 3 to 5 years. Epilating Head- The epilator head should be well designed to follow the curves of your body in sensitive areas for gentle and painless epilation. Look out for sensitive area cap attachments in case you are buying an all body epilator. Also look for massaging or vibrating pivoting heads for a gentle and comfortable epilation. Speed Levels- It is better to have adjustable speed settings so that you can use a lower speed for bikini areas. Tweezer Count- More number of tweezer heads will cause more pain in sensitive areas, look for models with the right number of tweezers or discs that can remove hair efficiently with least pain. In some models the cap will limit the exposure area to a lesser number of tweezers making the epilator suited for Brazilian. Cordless or Corded- Epilators can be cordless when they come with a rechargeable battery but will be more expensive when compared to corded ones that work on mains supply. For bikini areas it is best advised to use cordless models as it can reach difficult areas better and waterproof models are also cordless. Extras– Other features to consider include built-in light, hypoallergenic or gold plated tweezers, shaver or trimmer heads, trimmer combs, cleaning kit, travel pouch and other attachments that comes with the epilator. Based on its cost, effectiveness, and versatility, the Panasonic ES-ED90-P with 6 accessories, is our absolute favorite—it truly is the best epilator for Brazilian. Not to mention, this epilator comes with some of the most important accessories for Brazilian, which are intended to reduce pain and irritation while gently tweezing away unwanted hairs. The rest of epilators featured here are not far behind in giving you a silky smooth Brazilian. Consider getting yours today, and experience smoothness tomorrow! Hi I’m confused 😐 please can you help. What’s the difference between the Panasonic ES-ED90-P and the ES-ED93? Panasonic ES-ED93 is the newer version of ES-ED90 but the features and specifications are the same. You can go for it it is available at similar price.